Windows: Microsoft has a nasty habit of pushing updates when they're least convenient. If you're tired of updates occurring when you're working, the new Anniversary Update can avoid them during work hours. Search for "updates" in your Start menu and choose "Check for updates." Under "Update settings," click "Change active hours." Set your Start and End time for your work day. Once you've set these hours, Windows will avoid pushing updates during that time frame. In previous versions of Windows, Microsoft often pushed them with no ability to defer them for too long if you were in the middle of work. 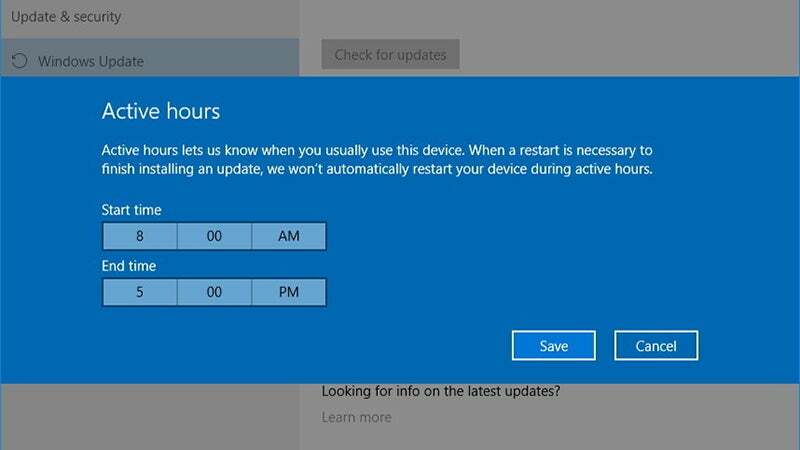 The most recent version of Windows (the one you're probably using now if you're not an Insider), allowed you to schedule a restart time later if you were busy, but this method is much better to make sure that updates avoid the times you're working.